Water and education are intimately connected in rural parts of Africa and Southeast Asia. By simply looking around the school grounds in northern Uganda, Africa, it is easy to see the important role water plays in the daily lives of students. Aside from the bright color of the children’s uniforms against the rural landscape, flashes of yellow were visible all over the courtyard as the students moved about. The yellow was not from books or backpacks, but from plastic jugs (jerry cans) that the pupils clutched tightly in their hands. The yellow jugs were an intimate part of the school landscape. Since the school had no water on its property, students took long breaks to fetch water from a well located a half-mile away. Many people cannot imagine a school without drinking fountains, flush toilets, or sinks in which to wash hands. Unfortunately, the scene above is common in many classrooms throughout Sub-Saharan Africa. Children’s education suffers greatly from a lack of safe water and sanitation for numerous reasons. Too often students use valuable class time to fetch water long distances from the school. Sometimes the paths are roads that are dangerous for children. They have to carry jugs that are far too heavy for their small frames, which affects the development of their spines as they grow. Frequently, they are collecting water from contaminated sources. Water and education are also linked in school absence. 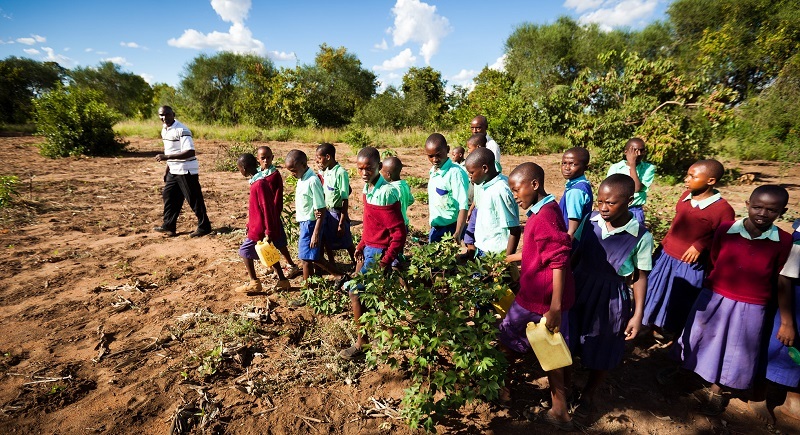 About 443 million school days are lost each year due to water-related illness. Unsafe water leads to severe outbreaks of diarrheal disease, one of the most deadly diseases for children in the developing world. Improper waste disposal and lack of water for proper handwashing perpetuates diseases such as cholera, typhoid, trachoma, and hepatitis. These outbreaks force school closures, making education impossible in some rural areas. Water and education are tied with gender equality. Girls who have to spend time gathering water for the family tend not to be in school. And where schools have sanitation, attendance is higher, especially for girls. Water is connected to health, since millions of children get sick and die every year from water-borne diseases and for lack of basic sanitation and hygiene. People all over the world cite lack of education as one of the main obstacles to reducing poverty. Lifewater understands that in order to improve education, issues like water and sanitation need to be addressed. That is why Lifewater is working to provide schools with safe water, latrines, and hygiene education in Africa and Asia. By reducing disease and providing for students’ basic needs for water and sanitation, schools once again become assets to the community and catalysts for a better future. Through their input and desire to learn, children are the most powerful resources in schools and communities as they struggle for safe water, adequate sanitation and hygiene education. Lifewater is engaging schools across Africa and Asia with the materials and knowledge to access and maintain safe water and sanitation facilities, as well as the tools that empower children to share their resources and knowledge with their families.